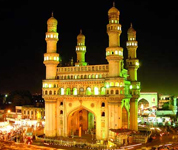 Hyderabad is the capital of Andhra Pradesh, India, and is one of the largest metropolitan cities in the country with an area of 650 square kilometres (250 sq mi).The city has a population of 6,809,970 with a further 7,749,334 living in the metropolitan area, making Hyderabad the fourth most populous city and the sixth-most populous urban agglomeration in India. The city is often known by the sobriquet The City of Pearls. Hyderabad was established in 1591 AD on the banks of the Musi River located at the crossroads of North and South India on the tip of the Deccan Plateau, leading it to develop a unique culture. The twin cities of Hyderabad and Secunderabad come under the ambit of a single municipal unit, the Greater Hyderabad Municipal Corporation. Hyderabad was once a global center of the diamond and pearls trade,and, during late 20th and early 21st century, the city emerged as a major global center for the information technology (IT) industry, and biopharmaceutical industry. The city is home to the Telugu Film Industry, known popularly as Tollywood. Hyderabad is home to many historical sites, including the UNESCO Asia Pacific Heritage site of Chowmahalla Palace The city is a regular tourist hotspot and carries many places of interest.